Tiny medieval siege warfare, with little plastic people and an actual castle to actually batter into submission with crossbows and catapults. All parts present and in excellent shape. Stickers have all been applied. Played two or three times. The box is in excellent shape with a few dings and scrapes here and there, but there are two pieces of strapping tape (used to hold the box shut once upon a time) stuck to the bottom. The original rubber bands (that power the siege weapons and exploding castle bits) all died long, long ago and will need to be replaced. Which I suppose I could do for you if you'd like. 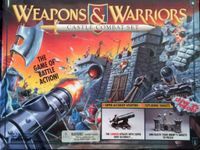 Bonus: Includes the original "Weapons & Warriors"-branded 15% off admission to Medieval Times coupon that came with the game! Now long expired. Like the rubber bands.